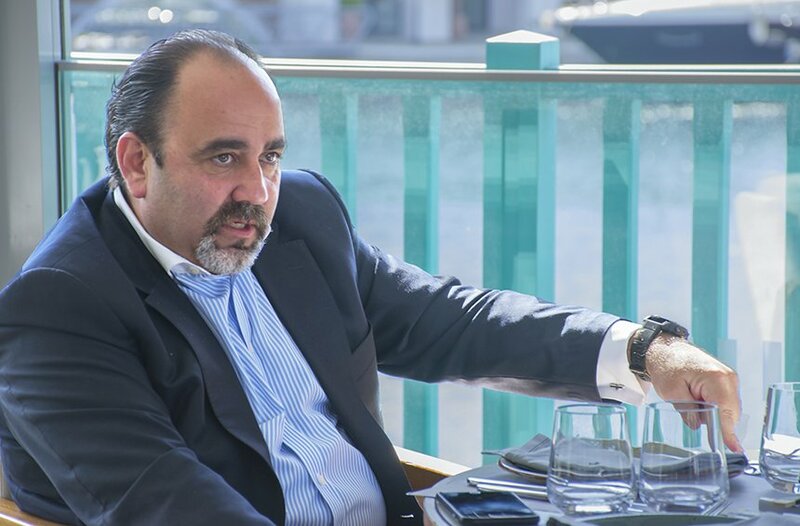 Marios Nicolaou talks about his crazy gang that ended up running the largest restaurant group in Limassol! Friendships that last a lifetime can, ultimately, be a recipe for success. 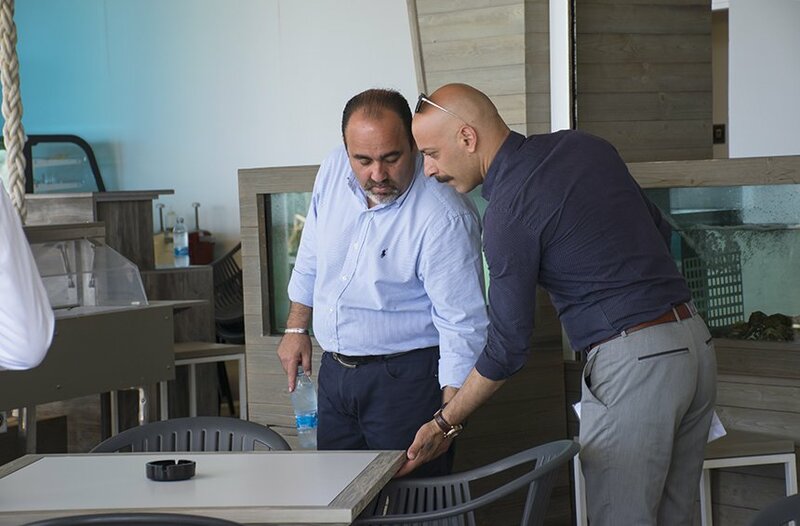 This is evidenced by the madcap group of students from Limassol who, after sharing years of youthful antics, joys and sorrows, dreams and disappointments, ended up founding one of the most successful business groups in Limassol, and creating some of the city’s most popular restaurants. 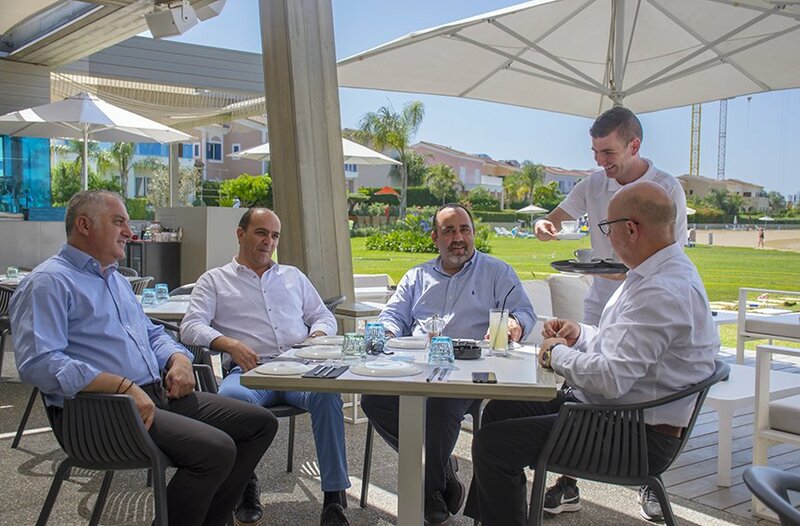 Marios, Nikos, Polys, and Christos have been doing what they love for 20 plus years, and have provided Limassol (as well as the rest of Cyprus) with some truly exemplary restaurants, upgrading the city’s image and, in some cases, changing it radically. 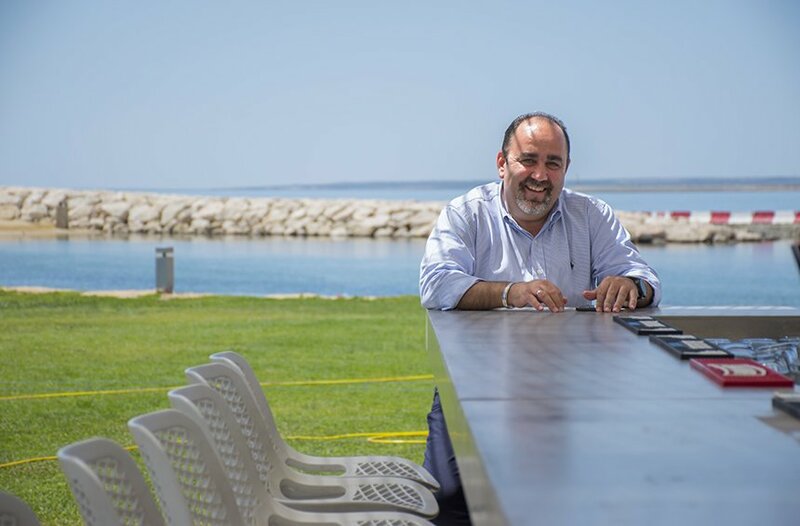 Marios Nicolaou, who is now the General Manager of PNS Restaurants, acknowledges the fact that this group of friends has, in fact, transformed the city’s culinary map. The defining moment in their journey took place in 2002, with a proposal from one of the directors of the N.P. Lanitis Group (Mr Vangelis Georgiou) for a joint venture that would bring to fruition a vision held by the late Evagoras Lanitis. It involved the transformation of the Carob Mill (then used as a fertilizer warehouse) into a restaurant complex. 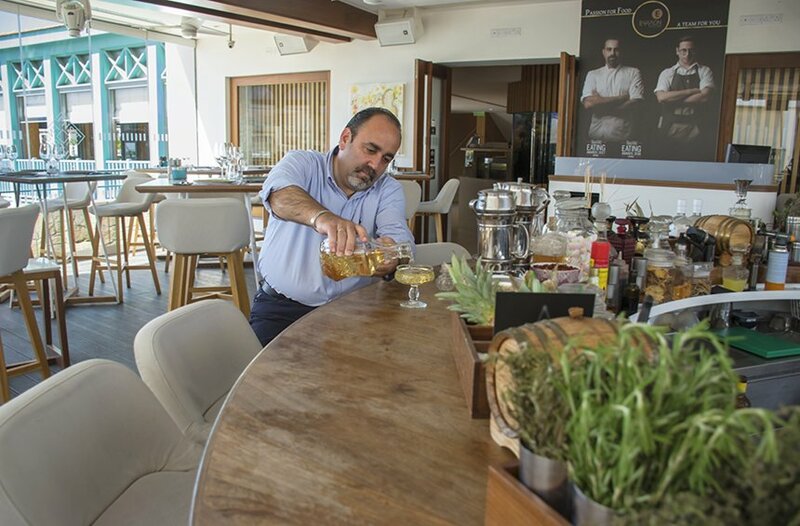 A collaboration was thus formed, called the Carob Mill Restaurants, which managed all the restaurant locations in the area around the Limassol Castle, namely Karatello, Artima Bistro, Draught Microbrewery and Stretto Café Lounge Bar. Marios is a man who always emits a sense of positivity, both as a conscious choice and as direct result of his naturally jovial personality. He maintains a warm smile throughout all his encounters, and is always up for a laugh and a joke. The fact that he has had the good fortune to be working alongside his friends all these years – something which serves as a daily reminder of his fun years at university in England – likely has a lot to do with his affability. A forthcoming and affable man, Marios Nicolaou began working in the food industry in his teenage years, and decided to pursue it professionally at the age of 16, despite the fact that no one in his family or social circle ever had a career in this sector. The main reason for his cheerful disposition, however, is his love for his work. “If you don’t love this job, you simply can’t do it,” he explains. His work, after all, provided a solid support system for him during one of the most difficult periods of his life. In 2005, he and his family suffered the terrible loss of one of their triplet sons at the tender young age of three, following a violent car accident caused by a reckless driver overtaking their car on the Limassol-Troodos road. 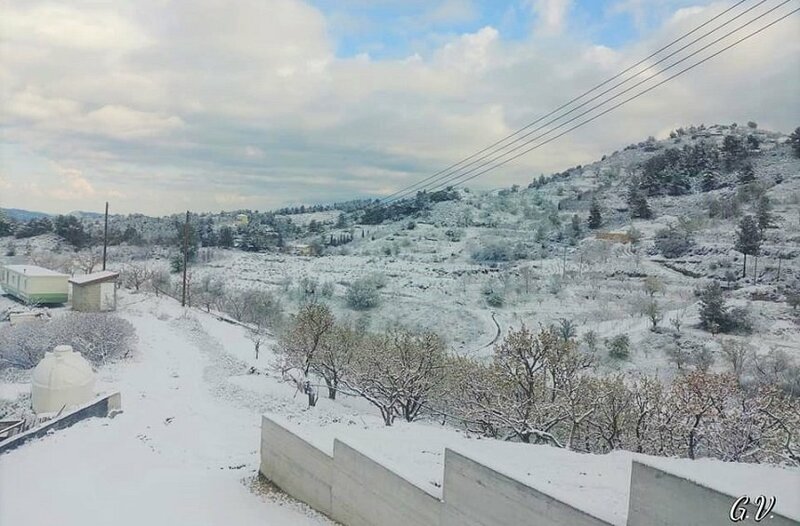 With everything that come as a consequence for anyone who has emerged from such a tragedy, Marios Nicolaou is now able to recount the incident with a sense of somber calmness. He explains how it made him realize firsthand that by focusing on only the good aspects of his life (his beautiful family, a job he loves), he was able to overcome even the worst blows of fate. 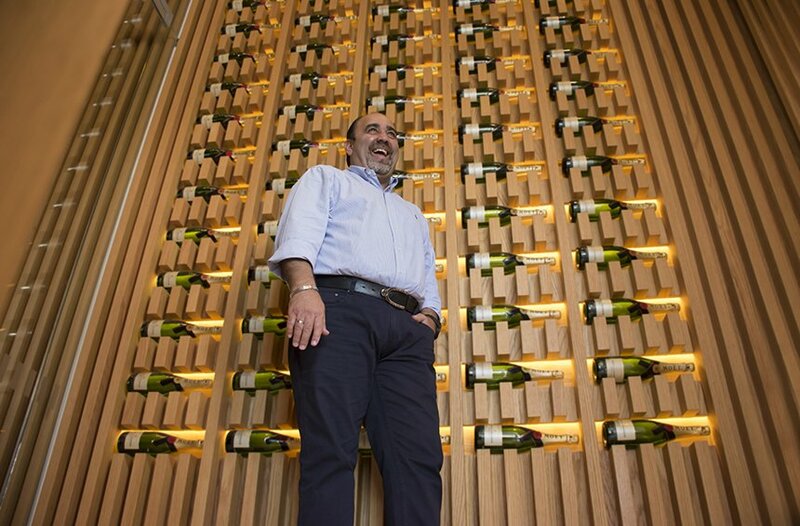 His passion for his work, therefore, was instilled in him long before the success of the Carob Mill Restaurants and their expansion in 2008 with the addition of Ryan’s Bar & Grill, Il Gusto, and the ‘Kouzina’ takeaway restaurants, before the expansion of the PNS Group into the food supply industry with the establishment of Food Supplies in 2010, and before the creation of Epsilon Resto Bar and the Marina Beach Bar at the Limassol Marina. It was a passion he possessed since his school years, when began working in the bars and restaurants of the Limassol tourist area, and it was what pushed him to leave home in 1985 at the age of 16 to enroll in a hospitality college to train to become a chef. Neither of his parents, nor any other family members, ever had any connection to this industry. Before he left for school in Nicosia, he had a long discussion with his father. ‘My father always talked to us about things, and he would make us consider everything carefully, without ever stopping us from doing something. He stressed to me that this was a difficult path to take, and that I would be working holidays and on days when most people would be off,” recounts Marios. Those years were a very big hit for the Hospitality School, with the Heads of the Cyprus Chefs Association, George Damianou and Panikos Hadjitofis, studying there, too. His experiences in Nicosia were not bad, but they were not enough to keep him away from Limassol. “Then came the years 1985 to 1990, the heyday of the tourist area nightlife. It was the golden age of this area in Limassol, and tourists would flock to the city. First it was the Scandinavians, then came the Irish. We were there, working, going out, flirting. That was when I made my first decision to open my own bar, and enter the business side of this sector,” Marios explains. Was the decision to open a bar purely a business one, or was it a way to pick up girls? No, it was purely business. We picked up girls anyway (laughs). I needed to do something of my own. We talked to Andreas Ioannou, my best friend, and we talked to the owner of the club Hollywood at the time, but at the last minute he hesitated and backed out. I then asked a friend of mine to help me find a job in England, and I left straight away. Thanks to his many years behind a bar, Marios has a great deal of knowledge about this part of his job, and, if time allows it, he won’t hesitate to jump into action when he wants to take care of a customer personally. Do you make all the decisions in your life that easily? Yes, it’s a characteristic of mine. I create shortcuts in the thinking process, and make a decision. I went home to my parents and, announced to them that I was leaving for England, while they were still expecting me to open up a bar in Limassol. I even told them to sell my car. I was going with the aim of staying there. When I start something, I don’t like to leave safety nets behind for me to fall back on. The only option is to keep moving forward, always towards something better. And so, within a short time period, I found work in England, and also selected the university in Birmingham where I would be continuing my studies in Hotel Management, and I moved. What job did you do in England? I was a waiter at a Cypriot tavern called ‘Troodos,’ in Leicester, a town so small, with an intense nightlife, that reminded me quite a bit of Limassol, so life was perfect there. At this tavern, I was doing something that I knew and I loved, and the owner, Leonidas Pericleous, ended up being a second father to me. To this day, we have an excellent relationship and see each other regularly. Many people say that England is grey, and the people are cold. How did you end up with such a different impression? The people are certainly different there. But once you sit down with someone with a pint of beer, it doesn’t matter if they are the Queen of England or a chimney sweep. They all loosen up. So if you want to get along well with people, you need to find ways to communicate with them. Did you meet your future partners in England? Yes, I met Nikos Sophocleous and Polys Pashias when we all lived together in the student dorms. In fact, one night playing cards, Polys and I discovered that we are cousins. The partners of PNS Restaurants may have grown up and are no longer the group of student buddies from England, however, their good-natured teasing and ribbing has not stopped at all, reminding them that they are still young at heart. Their playful mood during the photo shooting, with Marios and Polys holding hands while walking, is just a small indication of that fact. Was the fact that you met during your student years a crucial factor? Certainly. At that age you develop deep connections with people. We all lived together for the remainder of our stay in England. We had lots of fun, of course. I remember one incident, when I had received a warning from a teacher of an early morning class that I was in danger of failing. I never made it on time because I would always work late, and go out afterwards (a habit I still carry to this day) and wouldn’t wake up until noon. After I received this warning, I went to bed at 10 o’clock the night before the class, put all my alarm clocks in pots and pans, and set the clock radio alarm to wake me up, to make sure that I made it on time. And indeed, I leapt up and started getting dressed. My roommate had to open the window for me to figure out what they had done. I did make it to the lesson, however, and I passed the class. Of course, I paid them back for that prank later. We played a lot of pranks on each other, and we still remember them today and laugh. Did you return to Cyprus after your studies in England? Before returning to Cyprus, I did a year of internships in the USA, at the Marriott hotels. Initially, I was in South Carolina and then in Orlando. These were both very touristy resorts, as I wanted to gain experience in these areas for when I would be returning to Limassol at a time when tourism was flourishing. The United States leads the way in the service industry, and I was heading towards a career in Hotel Management. I had a great time in the US. I was initially on an island in South Carolina. I worked in a kitchen, where I was the only white guy among 40 black guys. I would head into the kitchen at 7 a.m., and the music would be blaring, and everybody was dancing. Do you think that it was pure luck that you always had a good time, wherever you went? Having a good time is something that I aspire to. I adapt to new environments easily. I like to take the most positive aspects of every experience, and in the end, I enjoy it. This is certainly a trait which helps me in my work today. Are you this happy and positive by nature, or is it an act? I’m even happier than I look. It’s something that is innate, but loving my job does draw it out of me. I’m having a blast! 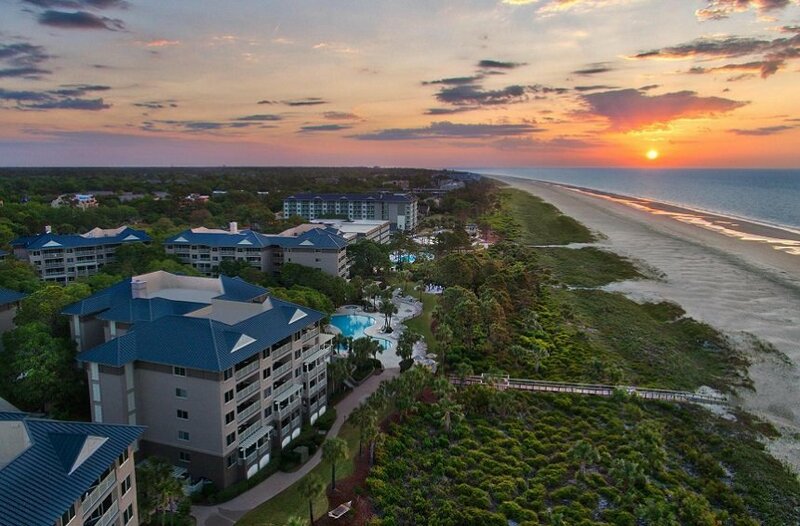 Marios Nicolaou recognized the great potential of the Marriott’s tourist resort in South Carolina, USA, as an opportunity for him to gain experience in the tourist industry. Did you have a blast working in the kitchen too? No, it certainly was not a blast. I do love to cook, but I only lasted a short time in the kitchen. This is because I find it to be a closed environment where the people and the scenery never change, and this doesn’t suit me. People’s success depends on them doing what they love. Everybody needs to figure out what they want to do, make choices that suit them, and bring those choices to life. Of course, this needs courage. And as in everyone’s life journey, luck also has a major role to play. Of course I do. This job has a lot of pressure, and there are a lot of details to oversee, especially when you are building something from scratch. Just like All About Limassol must pay attention to every last detail of a tribute, from the photos they will use to the information that they will articulate, in order to create a positive image of Limassol, in our job every detail is important to make sure someone’s impression of our restaurant is always positive. We find ourselves getting anxious about whether our restaurant has made a profit, whether any problems have arisen, and how to go about solving them. 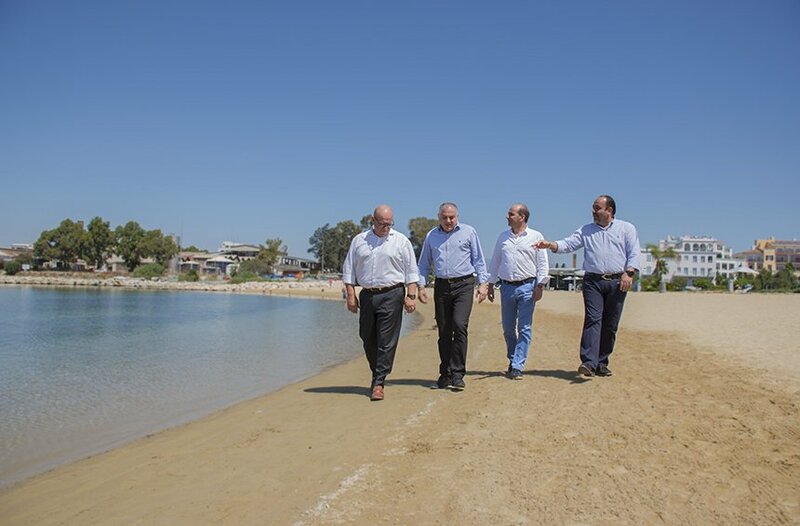 “I returned in 1994, when Limassol was in ruins due to the fact that the sewage lines were being installed in the tourist area, and the entire seafront road was dug up. I worked for a while at Limassol Bouzoukia, but I was searching for a hotel job. 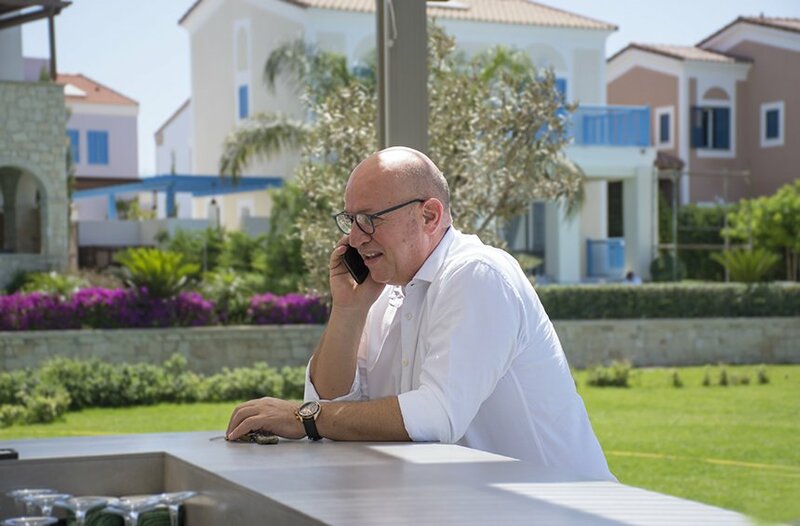 I couldn’t find anything in Limassol, so I ended up in Paphos, working for the management team of the Phaedon Hotel,” recalls Marios. How did the partnership among the four of you come about? A short while later, a managerial position in Food & Beverage opened up, and I recommended it to Nikos Sophocleous, my friend and classmate. In the meantime, Ryan’s Restaurant in Akrotiri had caught the eye of Polys, the other friend in our group, and wanted to take over it. He suggested that we all go in on this together. At the time, I had an advanced career at the hotel, with future prospects, so I did not take that step. I also had my reservations, as I believed there were too many of us to run just one restaurant. Nikos left the hotel, however, and the two of them began their collaboration. Polys kept insisting on getting me on board, of course – he and I are the stubborn ones of the group. In order to convince me, he suggested taking out a loan to open up a second restaurant. At around that time, I also found myself caught in a disagreement with my manager at Phaedon. 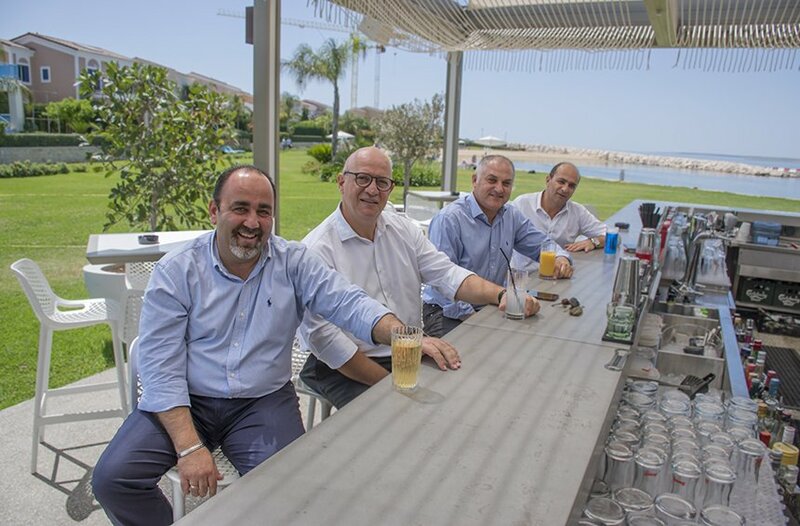 Christos, Marios, Polys, and Nikos (left to right), created one of the largest restaurant groups in Limassol, successfully contributing to the advancement of the industry and overall upgrade to the city’s offering. That same night, I called Polys and said “I’m in.” My only prerequisite was that Polys and I would not be managing the same restaurant, as we are both the most stubborn people in this partnership. We therefore started off with two restaurants, Ryan’s, and the tavern ‘To Istoriko,’ with the prospect of setting up four restaurants, one for each of us. It was a good thing, then, that you all knew each other well. Yes, living together helped us get to know each other inside and out. Was money or glory ever a cause for tension? Because of the fact that we knew each other so well, we never fought, and we never doubted each other’s intentions. Our partnership was established on a firm foundation, and we all gave and received equally, with everything divided four ways, so the financial issue was never a cause for conflict. This was the reason that none of our wives or children ever entered the partnership, so as not to lose this balance. To give you an idea, at the time when we are all still living together in England, we would pool all our money together in a drawer. If the drawer had money, we would all spend it; if the drawer had no money, none of us would eat. The financial aspect of the partnership was never one that concerned us, and it was never something we needed to discuss. This is just how our partnership was built. Did you ever reach a point when you wanted to break up? We did. 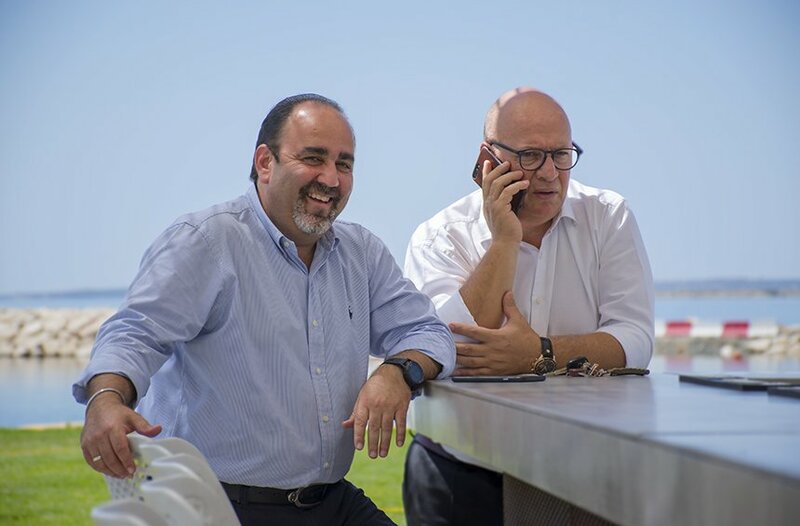 There was a time in 2009 when we were affected by some disagreements among the managers of the Lanitis Group, with whom we were collaborating on the Carob Mill Restaurants. It caused friction among us, but thankfully it didn’t break us. Does the fact that you don’t consider money a priority in your work have an impact on the product itself? Certainly. In the restaurant business, we always invest more in the product and the service we provide. In fact, the products which we offer to our restaurant customers on the house often exceed the amount of €500,000 per year. It’s more important to leave a positive impression on a customer by offering something on the house, be it a dessert, coffee, a bottle of wine or even something more substantial, rather than to try and promote my restaurant as the best in the industry through an advertising campaign. We are a small society, and people get recommendations through word of mouth. This is why we never really focused solely on the tourist market. Of course, you need to know what you are offering on the house, and to whom. These are some of the tricks of the trade that Leonidas taught me in England. He was my mentor at work. After 30+ years in every position in the industry, from barman to dishwasher, server to cook, and finally restaurant manager, it is impossible not to have learned every trick of the trade. This is the philosophy of our partners, which has also been passed onto the restaurant managers. Of course, it’s also a matter of character, because if someone is stingy by nature, then they won’t offer anything on the house. But since we work in the hospitality sector, it is imperative that we are open-hearted. This is a trait I always had, even as a child. As a young boy working in the tourist area, I would often take people home with me and offer them whatever my mother had cooking on the stove, even if it was a pot of lentils. Why have professions in the hospitality industry been so undervalued? No mother wants her child to be a waiter, she considers it degrading. Everyone goes to university, even if they aren’t good at what they’ve chosen to study. And in the end, the waiters who work for our restaurants make better money than many of the young people who are somewhat following their chosen profession. It is, of course, a tough job. It involves a lot of hours, you have to work nights, you lose holidays and weekends, but there is a permanence to it and it allows you to work in a pleasant and beautiful environment. I find that we have lost this loyalty, however, and this quality that will make people pour their heart and soul into their work, overcome difficulties, and find a way to enjoy what they do. Now, the concept of easy money prevails, of making quick profit. The image of the Castle Square today, with its plaza and pedestrian areas, is a far cry from the images of 2002, when the Carob Mill Restaurants first opened. The area’s regeneration came in 2011, after the establishment of the restaurants and the subsequent refurbishment which took place. Do you believe that we have created the wrong role models for success? Yes. Today, you are only considered successful if you are a doctor, a lawyer, or an office manager. Don’t you and others who belong in this industry, share responsibility for the fact that there is no role model of a successful chef or waiter? When someone does something, and it goes wrong, it is that person’s responsibility. We are responsible, because we did not come together to promote an accurate image of professions in the restaurant business. Now, we are lagging behind in the development. The same applies to other sectors. In every business, you will find that there is not enough staff to cover its needs. How is it possible that we have such a high number of graduates, but not enough qualified staff? I think it has a lot to do with what professions were fashionable at the time that people began their studies. At first, it was teachers, then everyone turned towards I.T., and so forth. So rather than someone choosing to study something that he or she was good at, even the most average student would pick a profession simply because it was the trend. Do you see this phenomenon in your children too? I find that they are at a loss of what they want to do at age 16, whereas at their age I had left home and gone to Nicosia to hotel school. I see a dullness and a sense of boredom, because they are comforted by their safety net. I aim to remedy this, by having them work in the restaurant, even washing dishes if need be. They will not be working as the owner’s kids. For them, I will be Mr. Nicolaou and they will be held accountable, as is all of the staff, to the restaurant managers. When selecting restaurant equipment and décor, much attention is paid to the quality and detail, even if this results in dishes that cost more than €30 and delicate, just respectively expensive glasses for displaying fine wine. Can the situation in this sector change? Yes. After the crisis, many mindsets have changed and some people began to realize that we are doing our young people a disservice. I remember an incident in the past when a lady complained to me that all the restaurant staff were foreigners. I had asked her, “Would your child work here?” and she replied “Well, he is at university and needs to rest when he comes home in the summer.” And so, since no locals wanted to work in these positions, foreigners took over. Before 1990 however, the dining sector was flourishing and young people were working in restaurants in large numbers. After that, we somehow tipped the scales and lost the balance. Money came into the stock market abruptly, and we had customers who would come in and choose only the most expensive items on the menu. Was the stock market the biggest blow, or was it the haircut? The stock market shook some people, but not all. The haircut was the biggest shock to our community. After that, smaller businesses began to shut down, and only the larger units survived. Costas Lanitis had told me at the time that we shouldn’t worry too much, because going out for dinner is the most cost effective option for a night out. Is that why most venues have evolved into lounge-bar-restaurants? This has more to do with the fact that late night outings have begun to die out. When ‘bouzoukia’ – late night live music – stopped being a popular nightlife option, people began to seek other outlets. In our business, you need to be a chameleon and adapt with the times. At first, people would go to the neighborhood taverns for a night out. Later, clusters of entertainment venues were formed, starting with the Carob Mill in 2002. That area was nicknamed a catwalk, because people who frequented there wanted to see and be seen. Is this tendency to show off a good thing? For us businesses, it’s a good thing. For society, it’s not. However, when you want to follow the example of large city centers, such as Athens, London, or New York, this is the direction you need to follow. Once the decision was made to make Limassol bigger, more modern and more contemporary (which I personally prefer), there’s no going back. We do still keep some things simpler, of course, which helps make entertainment and food affordable for many people (it is no coincidence, after all, that up until a few months ago there were no Michelin-starred chefs in Cyprus – it was only recently that Mavromatis from the Four Season’s Vivaldi restaurant was awarded this distinction). 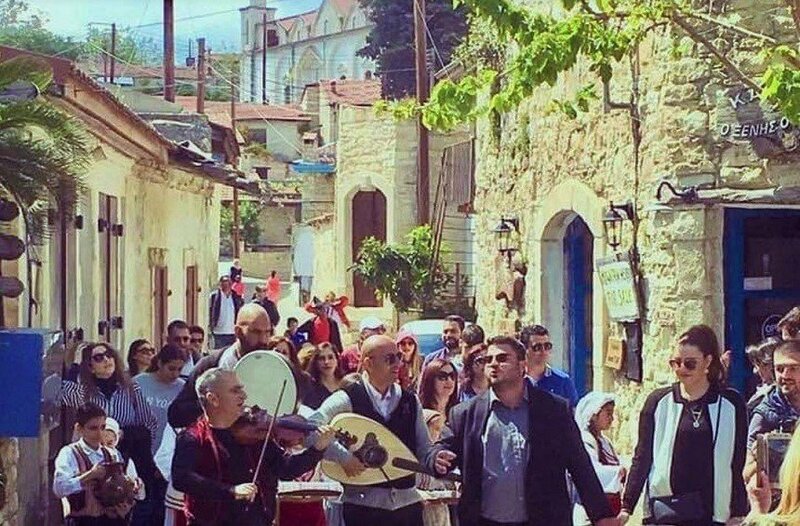 Additionally, due to the traffic and parking problem in Limassol, people who go out to eat will want to stay in the same place and enjoy music and drinks until 2 a.m. Restaurants are continuously opening in Limassol. Is it really that easy? Many people believe that they can open a successful restaurant, simply because they have saved up some money and made a circle of acquaintances. For such an endeavor to succeed, however, one must have knowledge and a love for this job. Those who do it simply as a small investment, inevitably end up losing money. The interior décor of Epsilon alone exceeded one million. In order for such an investment to have decent returns, the venue must operate in many different forms, from early in the day to late at night. You don’t make money right away. You invest in a restaurant and expect to make an income in the long run. 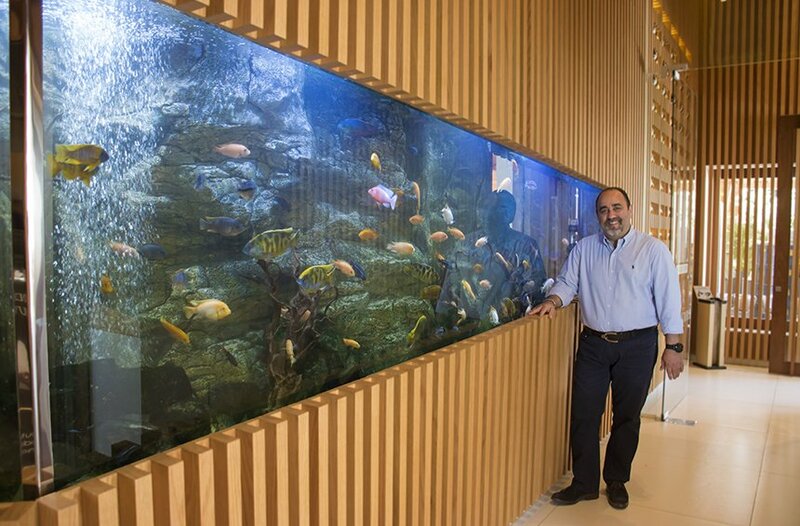 The design of Epsilon Resto Bar, a venue which has been awarded many times in recent years for its décor and cuisine, was by far the largest investment made by the company. Have any of the restaurants you opened failed? Around 2007, we decided to open Central, a Surf & Turf Steakhouse. It was a more upscale restaurant, with an eclectic cuisine, that we opened in the center of Limassol, near the Panagia Katholiki Church. The area there was still underdeveloped, and perhaps not suited to such a concept. We made the mistake of creating a luxury venue that was still rather out of place and foreign to some people. This must have cost you a great deal of capital; do you regret this decision? No, I don’t regret it. It was a loss of more than €1 million, but this is to be expected in this business. In order to win some, you need to lose some, and even when it is a loss of such a large amount, we know that there is always something to be gained by the experience. What hurts the most is the lost time we spent, and the embarrassment of failure. How did the dissolution of the Carob Mill Restaurants come about? There were issues with some of the directors from N.P. Lanitis. We had made a decision with one of them, which was then unilaterally canceled. The immediate consequence of that was a break in the trust of the partnership. So, where there was once an excellent collaboration with all the Lanitis members, this relationship was shaken due to loss of trust. Our partnership was on a good trajectory, but inevitably, when dissolution comes after a period of tension, there are always some bitter feelings left. In the end, the restaurants that were located on the private premises of the N.P. Lanitis Group remained under their management. Does the fact that the dining and entertainment venues are all strategically grouped in specific areas bode well for the future of the city? It’s not a good thing, no. If the pie doesn’t grow evenly, so that all areas can get their share of it, there will soon be a problem. In order for a city to develop in a healthy way, there needs to be progress for all. If the city doesn’t grow, and small nuclei are created instead, at some point there will once again be a shift of the population from one area to the other. 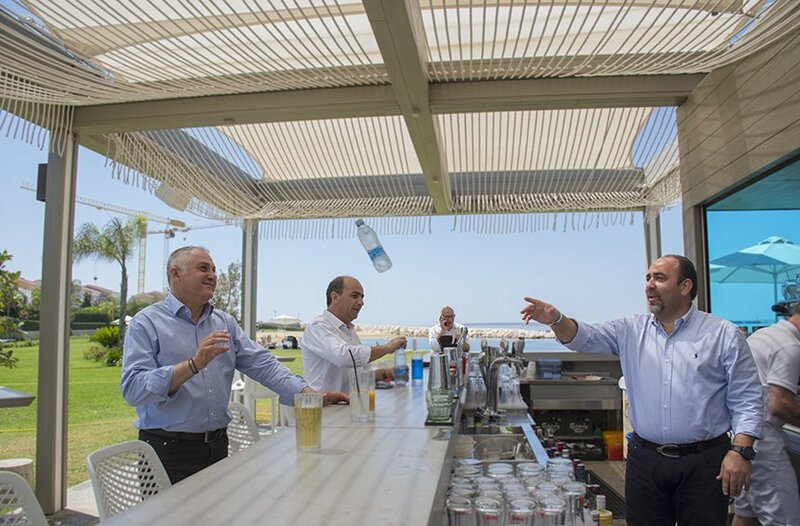 How do you view the changes that have been happening in Limassol in recent years? Limassol is following a growth pattern which I generally do like. A lot will change in the city in the near future, especially with all the great developments that are in the making. Each of the new towers that will be created will bring new, big names to the dining industry, with 2-3 restaurants each. 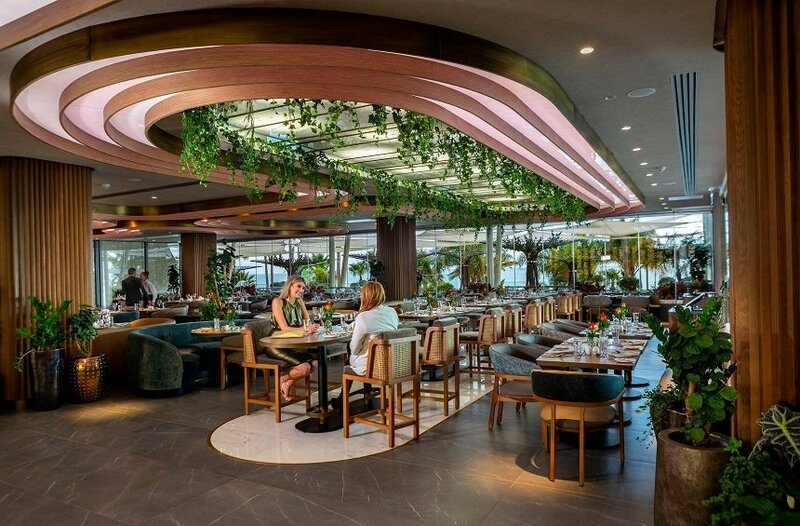 If these properties do not attract new permanent residents, however, then some other venues will inevitably have to close due to the operation of these new restaurants. We don’t know how things will evolve, and this scares me somewhat. Do you like Limassol as it is today? I am excited by the fact that the city is growing, and I hope people do come to live in these towers that are being built. What stands out for you in this city? The fact that Limassol offers it all. You have the sea and you have the mountains. You have remarkable entertainment venues, opportunities for shopping, and a unique diversity that can satisfy all tastes. Has Limassol promoted this quality adequately? I don’t believe it has done so to the extent that it could and that it deserves. There is still room for it to emerge as a city with the character of a country capital. 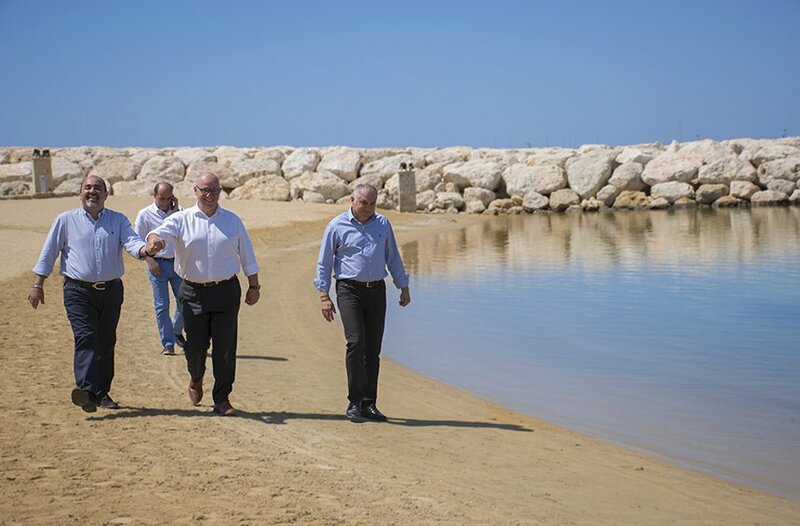 This is something that needs to happen in order for the city to develop further, and, of course, the work done by All About Limassol does play a central role in this. 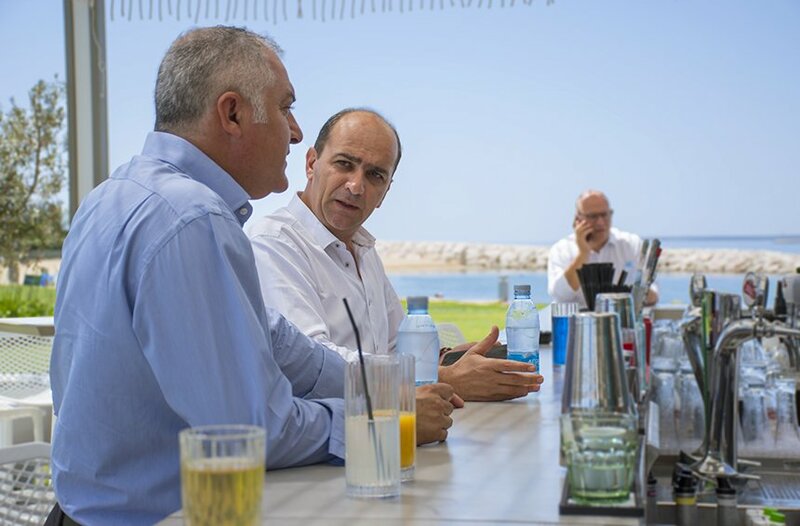 The option of a collaboration with PNS / Carob Mill and Christos Mouskis (Four Seasons Hotel) to manage all the restaurants at the Limassol Marina was proposed, though this project did not ultimately come to come to fruition. From the perspective of the restaurant industry in which you work, has there been adequate promotion of the Limassol’s offering? No. This is something that has long concerned me. We have the Organization of Entertainment Venues, but there is nothing that functions as a means of coordination of all industry professionals in Limassol. This was a mistake on our part. This is why I consider the work done by All About Limassol (as the Official Source for Promoting Limassol) to be of paramount importance, because no one truly knows what Limassol is made up of as a whole, from its beaches to the city center to its countryside. As the city grows, it becomes all the more impersonal, so it’s essential to promote this well-rounded representation. You have chosen to live in the countryside. Do you find that there are problems with the infrastructure there? Yes, there are flaws. We didn’t really identify them when our children were younger, but now that they are older and they need to go places and go to their after school lessons, we see the problems. We have essentially become their taxi drivers, because there are gaps in the transportation system. This is an area where Limassol needs much improvement. We don’t just need buses to serve tourists on the beachside road. There should be routes for the countryside, and the nearby villages, which allow people to travel to and from the city, even late at night. Can this help the economy? Of course. A 17-year-old who can travel with ease into the city to go out, eat, and have a good time, will not only bring profits, but also life to the city. I always tell our waiters that our best customers are the ones who don’t have much money because for them, every last euro they give to us counts. The headquarters of PNS Food Supplies is located in the industrial area of Kato Polemidia. The company was originally founded to meet the needs of the Group’s restaurants, but it is now expanding much further. Do Limassolians have bad traits? We are not active enough, I would say. Perhaps in relation to other Cypriots, we are more willing to try new things, but we can still do more. We often stay in our comfort zone, ignoring the many faults and problems that exist. We have a hard time identifying specific problems, such as a lack of parks, poor quality of life, traffic, etc., and we don’t search for solutions that will solve these issues. Beyond that, we all have very bad driving etiquette. The way we drive and park is problematic, to say the least. Drunk driving, dangerous overtaking, even the continuous use of the fast lane on the highway, these are all major faults. We lack education in this area. I see this even in myself, as I will park anywhere, except of course in the disabled parking spaces. Do Limassolians love their city? Theoretically yes. They don’t take care of it though. We show our love in words, not so much in actions. Is life expensive in Limassol? Some things will inevitably be more expensive. We are an island, so all products have longer to go to get to us, which creates an additional cost. This is something that we see daily in our food importing company. Beyond this, however, we also have been forced to increase wages in the restaurant business, since the labor supply has decreased. This cost is passed on to our customers. All the crucial decisions Marios Nicolaou made in his life were instantaneous. From one moment to the next, he was able to determine the course his career would take (from his studies to his first business steps). Why must we create restaurants with this much luxury, which generate such high costs? Because if these restaurants did not have this characteristic, no one would visit them. This is what people want, and this is what we offer. If people only wanted small, simple neighborhood taverns, then this is what we would operate. Why does Greece have better food at lower prices? 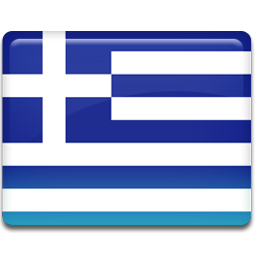 In Greece, it is easier to access cheaper raw materials, which are also very good in quality. Additionally, after the crisis, the cost of labor has fallen, not to mention that it is much more common there to steal from the state through tax evasion. 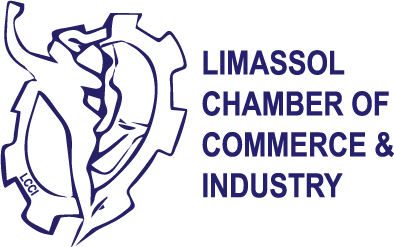 Do you find there is professionalism in this sector in Limassol? There was once, but we lost it to the money grabbers looking for easy profits over the past decades. Only now are we beginning to see this professionalism again. The opportunistic practices that once prevailed, and this duping of foreigners (crab passing off as lobster, squid passing off as calamari, frozen fish being sold as fresh, beef that was actually pork, and the taxi drivers with outrageous tariffs) were the reason for the dissolution of the tourist areas. 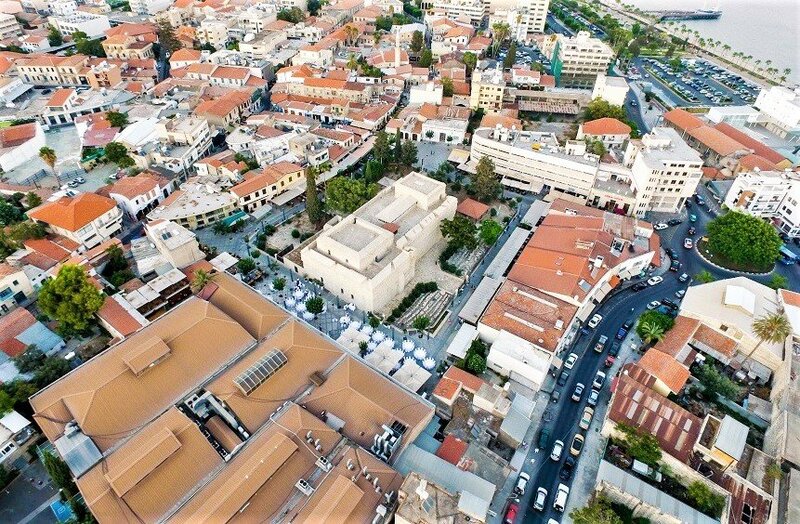 What would you like to see in Limassol in the next 10 years? I would like to see it grow in equal measure, for there to be development (both in population and in real estate but also in infrastructure) across all areas. This will create a real prospect for even greater progress. I’m on my feet at 6.30 in the morning. I take the kids to school every day, I exercise for an hour, and then I go to the office. I always like getting to the office first. The day usually ends at 2 a.m. During the day, I sometimes have the luxury of going home for lunch, to see my kids for a while. But this job certainly does come with long hours, stress, and endless things to do. However, our work is a way of life, because it is something we love. You’ve done quite well for yourself; why do you still feel the need to work so much? We haven’t yet made an amount that we can put aside and be set for life. All the money we’ve made in recent years is constantly being invested back into new projects. We recently set up shop in an old townhouse on Agiou Andreou Street, where we are getting ready to open a new restaurant, and where the new headquarters of PNS Restaurants are located (we wanted to be in the city’s historic center). Our good restaurants, such as Epsilon Resto Bar in the Marina, are now working at a very low profit. When there is a profit, this is usually below 10%. When you go out, do you go to places that are not within the Group? I never go to our own restaurants. One of my favorite restaurants is the restaurant at Alasis Hotel. I also like Vivaldi by Mavromatis at Four Seasons Hotel, as well as its Asian restaurant. I consider the Steak House of Columbia Plaza to be a timeless classic. Besides, I have very good relationships with other professionals within the industry, so we often exchange ideas and other work-related information. After the Carob Mill Restaurants came to an end, the 4 partners of PNS dynamically carried on with their goal of developing PNS even further, following the motto of “what doesn’t grow, dies.” In the context of this development, they have also collaborated with the restaurants of the Bianca Company (Milk Bar, Frankie’s Social, Gin Fish), known for the unique experience they offer to customers. What are your greatest enjoyments in life? Good food, fine wine and good company are some of life’s greatest delights. I eat modern cuisine in large quantities (which is why I also hit the gym). Beyond that, I enjoy looking after my appearance and my clothing. I do spend money on trips, as well, because traveling is one of my greatest pleasures. Would you ever want to live anywhere else besides Limassol? I like big cities, such as New York and London. Of course, I don’t know if I could live in London. I do know that if somebody took me to a small English village, I would die the next day. Nicos and Christos are the ones in charge of the group's expansion with rotisseries. Polys is the one who wanted the friends gathered together in a business group. Marios and Polys are the stubborn ones, so they agreed to manage separate venues. Together with the managers of each venue, they solve smaller or larger issues every day. Have you achieved the dreams you started off with? I followed a different path than what I had imagined when I began my studies in England. From Hotel Management, I found myself in the restaurant business. But I am proud of what I have achieved and I am satisfied with the fact that I am involved in something big, something with the prospect of constant growth. My view is that when something doesn’t grow and evolve, at some point it will die. Are you happy with your life, then? Yes. I think things went well for me. 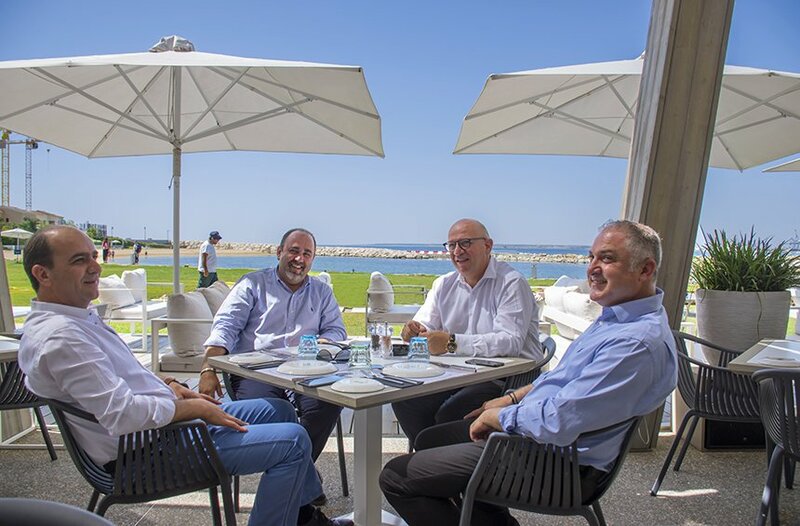 They may have contributed to the development of Limassol’s culinary map, but the four partners continue to dream about the entire city’s future, eager to see it grow and firmly believing that the prosperity of their Group is intrinsically linked to the growth of the city as a whole. Being able to enjoy your work as much as your time off is not just luck, it’s also an art form. The four friends of the PNS Restaurants Group have ensured that the paths they took in life led up to this. They complement each other, and offer support through thick and thin, each having paved their own way forward without a family reserve to fall back on. 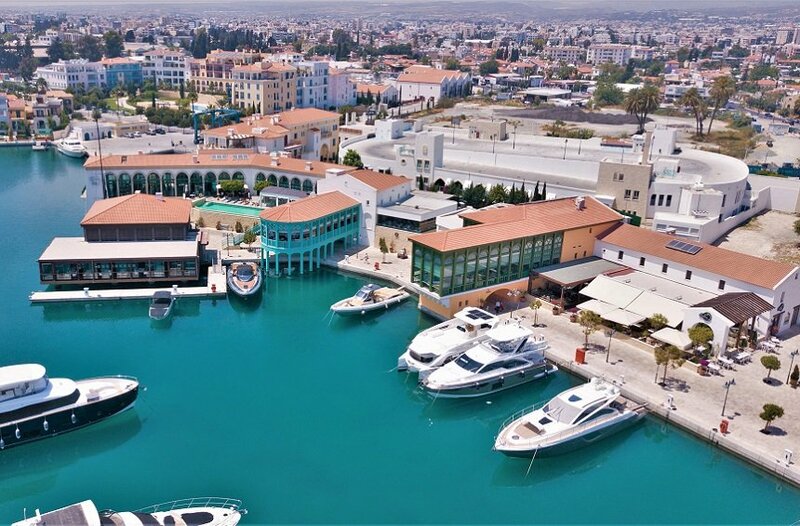 They drew inspiration from the colors and beats of Limassol in the ‘80s, where they grew up, and created Limassol of the 21st Century, joining the ranks of those who have taken risks to build the Limassol of tomorrow. Marios Nicolaou is the kind of man who proves that positive energy is not just a buzzword. Always holding on to the positives of each of his experiences, he invests in them and turns every negative into an advantage, forging an exemplary course in his field. With a deep love for his city and his work, he and his partners are without a doubt among the Limassolians who found a way to act on their concern for the progress of their city.